I didn't want to see this movie. I don't know why, it just didn't look like something I'd be interested in. A boy on a spiritual journey... blah, blah, blah. But I take my Oscar movie scouting very seriously, so I saw it anyway. And I am so glad I did. I liked the movie. A lot. For one thing, it's visually stunning. Slate wrote a snarky comment about it, saying it looked like it was "projected onto a solid cube of clear jell-o." While not conceding that I agree with the comment, I'm not sure why it's necessarily a bad thing. Are the graphics over-the-top and the colors so saturated it almost seems cartoon-ish at times? Yes. But I think Ang Lee did it on purpose. If he didn't, then he accidentally had a stroke of genius. The entire movie is an allegory!! It's fantasy! Why not make that story as over-the-top as possible? 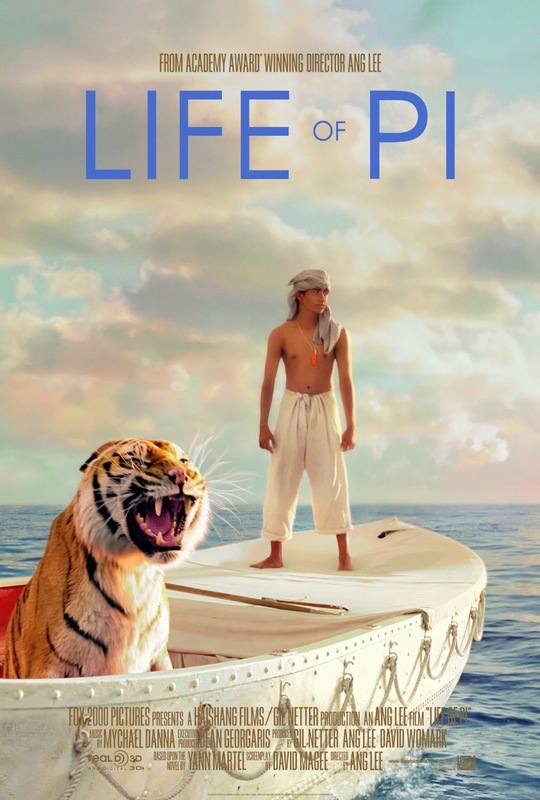 I mean, honestly, 95% of the movie contains a tiger - how realistic do you expect that to look? Speaking of tigers...I am probably biased toward the movie just for the tiger alone. Tigers are my favorite animal in the whole word (and yes, I realize that makes me sound like I am a twelve years old). Seriously, though, I donate to the Panthera organization for the preservation of large cats. Tigers don't get as much love in the movies as they should, since audiences seem to get all wowed over lion's manes and Mufasa really sealed the dominance in popularity of the lion over the tiger in Hollywood (he even has his own Urban Dictionary page!). All the tiger has gotten is The Jungle Book and Aladdin. And Raja can't even talk! 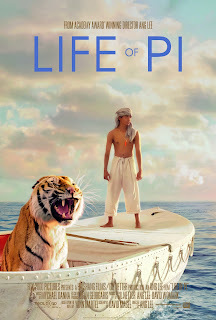 But that aside, this movie may bring people over to the tiger side. Sure, the majority of the tiger shots were special effects, but most of it looked real enough and frankly, it was cool anyway. It's not like the movie makers were trying to pretend the whole thing wasn't CGI. But special effects alone do not make a movie. (I know a lot of people were fooled by watching Avatar.) The plot does center around religion and finding God and all that, but can be easily overlooked if you so choose. It sort of like The Matrix - the plot theme is obviously there at the center, but manages to not ruin the movie (Keanu does that one on his own). Obviously if you're a big spiritual person (and you loved The Alchemist), feel free to take it all in. All I'm saying is that non-God lovers can enjoy this movie as well without feeling like they're sitting through a church sermon. Final word: A bit like a Bollywood version of Castaway without singing and a whole religious/spiritual angle added.